Energy politics are at the centre of all developed economies, and New Brunswick is no exception. Unfortunately, the energy portfolio has been unforgiving in the picture province; many more fumbles than accolades mark recent memory. Straddling environmentalism and realism, I admit the province is in a lot of debt, and energy inaction is not an option. With proposals for fracking and piping Alberta bitumen to Saint John taking shape, the province has much to consider, including being mindful of over reliance on hydrocarbon production. As technological efficiency inevitable improves, oil and gas dependent economies will lag as the world around them makes smarter energy choices. An important fact foregrounding the energy debate is that New Brunswick hydrocarbon production may not hold competitive advantage for long. Consider that the US is quickly becoming self-sufficient for fossil fuels, and Australia just discovered a huge reserve of frack-able hydrocarbons, much closer to Asian markets than Canadian products. New Brunswick needs to invest in an energy project that is both profitable in the short term and sustainable for decades to come. If Big Oil can afford to get tar sands bitumen to Saint John without a dime of public money, they are more than welcome to do so, as long as they respect environmental standards and Aboriginal rights. But why are we talking about fracking and oil pipelines without talking about nuclear power? 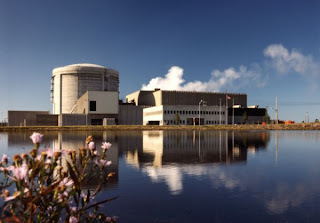 Yeah, Point Lepreau’s been dogged in the news by overrun costs and deadlines, but Atlantic Canada’s only nuclear power plant was built with the possibility of adding a second reactor in the future. Over the years, interest in a second generator has ebbed and flowed; most recently, Alward shelved a Graham-initiated feasibility study shortly after assuming office in 2010. The ideal energy grid is 100% renewable, but I acknowledge that’s likely not the Canadian reality of my lifetime (I'm a late 80's millennial). Atlantic Canada has energy needs that cannot yet be cost-effectively met with renewable energy technologies; a transition to sustainable energy economy needs to be prioritize safe nuclear technology over traditional hydrocarbon production. By coordinating university research and college training investments with the regional energy projects of the West-East pipeline and a second generator at Lepreau, Saint John has an opportunity to become a Canadian and North American energy leader, providing for substantial energy demands from the New England states. At the end of the day, I find myself more satisfied with the safety standards of nuclear power generation than fracking. Combine that feeling with wisdom against strapping ourselves into the oil economy, and a Lepreau upgrade starts looking a viable option for getting New Brunswick’s finances back on track.